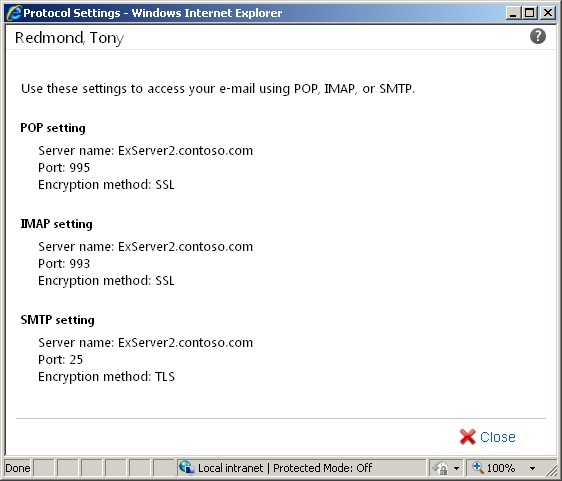 The “Account Information” page of the Exchange Control Panel (ECP) contains a pointer to “Settings for POP, IMAP, and SMTP access…” The intention is to provide users with the information that they need to input into clients that use these protocols so that they can connect to Exchange. Users need to know the name of the client access server to which to connect, the port number for the protocol, and the encryption type security setting. These values are held in the ExternalConnectionSettings property of the CAS server and are set using the Set-POPSettings and Set-IMAPSettings cmdlets. Most companies provide a receive connector on a hub transport server that POP3 and IMAP4 clients can use to relay their outgoing messages. To make users aware of which server to use, you publish information about the connector by setting its AdvertiseClientSetting property to $True. In this case, I’m telling users to connect to the default receive connector on a hub transport server, but in production circumstances you’d be more likely to create a specific receive connector that is dedicated and configured to act as a client relay. Remember that the POP3 and IMAP4 settings are server-specific, so you have to set the values on all the CAS servers that you want to use for this purpose. Hope this helps to fill in one of the mysteries thrown up by Exchange 2010. 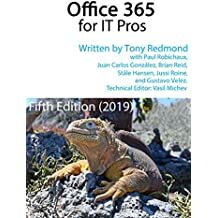 Read more about the Exchange Control Panel and how to use it effectively in my Microsoft Exchange Server 2010 Inside Out book! This entry was posted in Exchange, Exchange 2010 and tagged Client Protocol Settings, ECP, Exchange 2010, Exchange 2010 SP1, Exchange Control Panel. Bookmark the permalink.